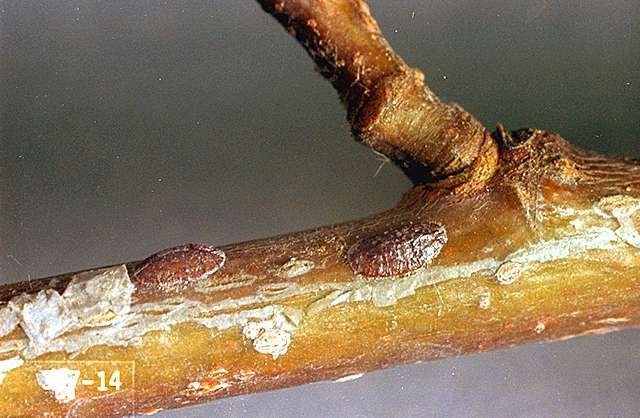 Pest description and damage Mature cottony maple scale are small, flat, oval, brown insects 0.25 to 0.375 inch in diameter. 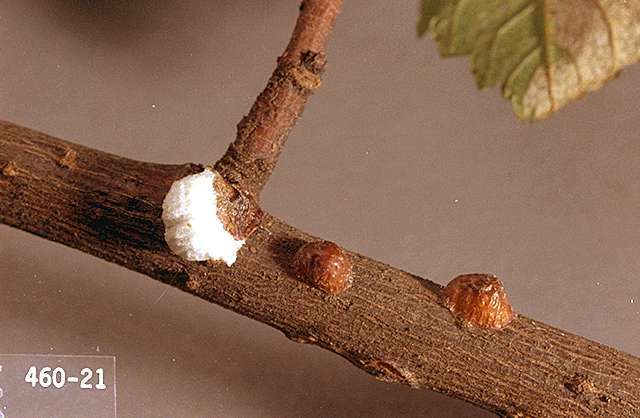 The "cotton" is actually waxy threads covering as many as 1,500 eggs. The developing females and nymphs produce copious amounts of honeydew which can collect on foliage and branches and cause growth of sooty mold. Honeydew is also a nuisance when it falls on nearby cars and sidewalks, and it also attracts bees, wasps, and ants. Occasionally, heavy outbreaks of this scale occur, usually on weakened or stressed trees. Cottony maple scale reaches epidemic numbers on silver maple, but noticeable populations can occur on red maple. It also is known to survive on other species of maple, honey and black locust, white ash, euonymus, oak, boxelder, dogwood, hackberry, sycamore, beech, elm, willow, basswood, and poplar.